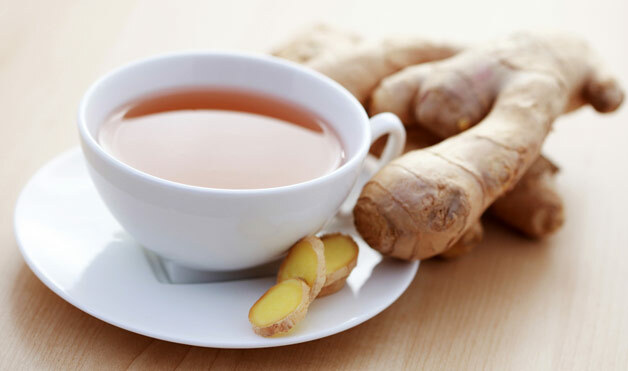 When I get the signs of a cold, have an upset tummy, or just need a little soothing but zingy pick-me-up drink, I drink ginger tea. Ginger is a wonder ingredient common in Asian food, beverages, and beauty treatments because of its great medicinal properties. In Indonesia, we consider it a ‘heaty’ ingredient that warms you up (great when you have a cold), helps digestion with its anti-bacterial properties, and can also be used in body-wraps used in spa treatments. When you’re done with these treatments, ginger tea mixed with palm sugar is also served as a traditional beverage. But I want to know – why does the ginger tea in Indonesia just taste so much more fragrant and richer than when I make it at home in NY? I‘m in Indonesia now, and I learned an Indonesian secret in how they make their ginger tea super aromatic and delicious, so if you’re a ginger tea fan, listen up. Normally, I make ginger tea by slicing ginger and boiling it in water, but the secret for really bringing out the aroma and depth of the flavor is to cook and whack it. That’s right. Cook and whack it! First, you have to pan-sear the whole (or large chunks of) ginger until parts of the skin are black. Don’t use oil; you’re basically just roasting the skin in a dry pan. Now peel the ginger skin off the best you can. Then, instead of slicing it into bits, whack the whole ginger chunk until it’s smashed near flat, like when you smash a garlic clove with the side of a knife. Then boil away in a saucepan covering the ginger with only a few inches of water. I personally err on the side of strong tea that I can always weaken with more water if needed. Sweeten with honey, sugar, or palm sugar – which tastes like a combination of flowers and brown sugar with a tiny pinch of salt. Delicious. My theory is that the pan cooking heats the ginger to release the aroma more, and whacking it brings out the juices, but whatever the reason, it works. Here’s another fun, inexpensive use of ginger in a beverage that I concocted: For a JUARA event at Fashion Week in NY this year, we made JUARA cocktails. One of them was a ginger tea cocktail in which I sliced a whole ginger (very thinly, no smashing needed) and put it in a full bottle of vodka (minus the volume of the ginger.) Leave 3 days, and voila – you have an instant ginger vodka infusion. It looks really pretty with the ginger slices floating, and tastes oh-so-spicy good. Chill and mix with tea, and you’ve got a ginger-tea cocktail. I also like mixing ginger slices in my Kombucha for a little variety, and am looking for other fun uses in drinks! At JUARA, we use it in our oil-free Sweet Black Tea & Ginger Mattefying Moisturizer, where the ginger works as an oil-control/anti-shine ingredient, so if you want to try that out, check it out here. Anyone have any creative uses for ginger in beverages, food, or beauty treatments? Have you read Eat, Pray, Love? Or did you take the easy way and just waited for the movie? Either way you’ve seen the beauty and spirituality of Indonesia. And that beauty is not coming out of the blue. Well, it should be in your hair. Rinse your hair with coconut milk instead of a commercial conditioner. This natural conditioner will leave your hair sooo soft and shiny. It’s a wonder nut alright. Candlenut (fyi: in Hawaii, candlenut is also known as Kukui) truly is a wonder nut. Candlenut oil is known for its remarkable skin care aids and its moisturizing properties as well as an awesome hair conditioner. The oil protects from harsh sunlight, drying winds and salt. So grab your bag and make a run to the next Whole Foods to get your own bottle of Kukui Nut Oil. Or if you want something a little more special here is your link to your own personal candlenut heaven: JUARA’s Candlenut Body Creme. Turmeric plays an important role in the life of any Indonesian. It’s used in multiple ways: as food, as a medicine, as a beauty ingredient. Turmeric is also used by women during an ancient royal bridal ceremony called Lulur. The root is used within that ceremony to cleanse the body and give it a radiant glow. Turmeric is known for its antioxidant properties and therefore widely used on acne prone skin. It does not only help fight damage from free radicals, but it also helps to reduce inflammation and evens out discoloration from old-break-outs.